Purchasing a piece of real estate in the world’s most famous city isn’t just for movie stars and the financial elite. Anyone can own a piece of property in the Big Apple for as little as $500,000. The NYC property market is filled with local and foreign buyers. New York City offers a desirable location for international investors to park their wealth in a hard asset. While stocks, bonds, and mutual funds make up the backbone of any financial portfolio, real estate is the anchor that keeps everything stable. Traditionally, real estate values in New York City have risen year on year showing remarkable growth. Investing in real estate brings a tangible real-world asset into your portfolio that you can bequeath to your partner or children. If you are searching for international opportunities in the investment real estate market, then here are five tips for purchasing real estate investments in New York City. It doesn’t matter if you are a small-scale investor looking to make your first deal, or a seasoned veteran of the real estate market, the first place to start in your investment research is with the end in mind. Do you want to flip, rent, or hold the property? Knowing what your outcome is before you invest your money will ensure that you choose the right property in the right neighborhood. 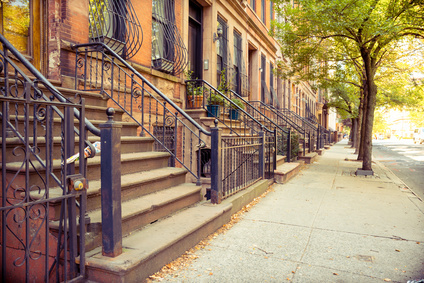 Speak to local brokers about neighborhoods that may be on the upswing. Many different restoration and urbanization projects are concluding all over the city within the next few years. If you are looking to take advantage of an undervalued location, then there are deals out there for you. Hell’s Kitchen is an excellent example of an undervalued neighborhood that is starting to see the signs of price growth due to the newly developed Hudson Yards. There are also eastern parts of the Upper East side that are appreciating due to recently completed subway projects that have made the neighborhood more accessible. Are you more interested in long-term growth in your capital? OR do you prefer regular cash flow from your investments? It is essential to take note of rental prices in the area and compare them with sales prices. There are some markets where property values have risen higher than rental income. For instance, a million Dollar property in Harlem might only rent for $3,750. However, there are areas where you can get a good deal, Bed-Stuy or Bushwick have properties that experience an 8 – 9% return. Regions of Midtown East have apartments that could close for $500,000 while providing rental of around $3,000. Make sure that you understand the costs of servicing and maintaining your properties at your New York location. Space is a premium in NYC. Therefore; you are paying per square foot, regardless of the size of the bedroom. Renters will pay more for an apartment with more rooms over an apartment with more square feet. Look for apartments with small bedrooms; you can even knock down the walls to connect two bedrooms and turn it into a larger space. There are certain buildings in New York City that have received abatements on their property taxes to stimulate local economic growth. If you are considering a long-term investment then these properties offer good value as when the taxes finally start to return in ten to fifteen years’ time, you will have settled a large percentage of the loan.